The Prima Trio, left to right: clarinetist Boris Allakhverdyan, pianist Anastasia Dedik, violinist Farhad Hudiyev. The Prima Trio—violinist Farhad Hudiyev ’08, clarinetist Boris Allakhverdyan ’08, and pianist Anastasia Dedik AD ’06—won the 2007 Fischoff National Chamber Music Competition’s coveted grand prize ($7,500) and the gold medal ($3,000) in the prestigious competition’s Senior String Division. The largest chamber music competition in the United States, the Fischoff was held on the campus of the Univer-sity of Notre Dame in Indiana in May. The Prima Trio, formed at Oberlin in 2004, emerged from a competitive field of 47 ensembles worldwide to capture the top prizes. They performed their repertoire—Khachaturian’s Trio for Clarinet, Violin, and Piano; Milhaud’s Suite for Clarinet, Violin, and Piano, Op. 157b; and Schickele’s Serenade for Three—at a grand-prize winner’s concert. Included in their award is a tour of the Midwestern United States in October and participation in the 2008 Emilia Romagna Festival in Italy. “We are extraordinarily proud of the Prima Trio, and I’m very pleased to offer them my heartiest congratulations,” says Dean of the Conservatory David H. Stull. The Prima Trio joins the exclusive rank of ensembles formed at Oberlin to have won the Fischoff Competition. Its predecessors are the acclaimed new-music sextet eighth blackbird, all of whose members were Oberlin students when they formed their ensemble, and the Miró Quartet, whose first violinist, Daniel Ching ’95, and cellist, Joshua Gindele ’97, were Oberlin students when the group was created. Hudiyev, from Turkmenistan, studies with Professor of Violin Milan Vitek. Hudiyev won third prize and a $1,000 scholarship at the 30th Annual Glenn Miller Competition in June 2006. Allakhverdyan, of Russia, is a student of Associate Professor of Clarinet Richard Hawkins. In March 2007, he won the second clarinet position with the Youngstown Symphony Orchestra in Ohio. This summer he attended the Lucerne Festival Academy in Switzerland, under the direction of Pierre Boulez, and the Norfolk Chamber Music Festival. Dedik, also from Russia, earned an Artist Diploma at the Oberlin Con-servatory of Music, where she studied with Professor of Piano Sedmara Z. Rutstein. Dedik will begin her studies with Professors Matti Raekallio and Yoheved Kaplinsky at the Juilliard School in fall 2007. Alek Shrader performs one of his winning arias at the Metropolitan Opera. 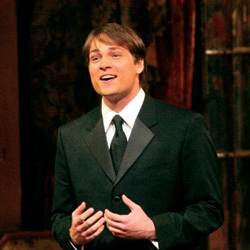 During spring break, while many college students were relaxing on beaches, tenor Alek Shrader ’07 was in New York City, singing arias with the Metropolitan Opera Orchestra and winning the Met’s 2007 National Council Auditions. Nearly 1,500 singers participated in this year’s auditions, held in 45 districts and 15 regions throughout the United States and Canada. Shrader was one of six winners selected from 11 finalists who made it to New York in April to perform with the Met Orches-tra, conducted by Marco Armiliato. He sang “Il mio tesoro intanto” from Mozart’s Don Giovanni and “Ah! mes amis” from Donizetti’s La Fille Du Régiment to win the $15,000 cash prize. Shrader graduated in May with a Master of Music degree in opera theater and a Bachelor of Music degree in vocal performance following his studies with Associate Professor of Singing Salvatore Champagne ’85. He is the third Oberlin-trained singer in the last six years to win the prestigious Met competition. 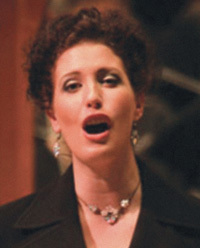 Soprano Alyson Cambridge ’02 won in 2003; soprano Carolyn Betty ’99 won in 2002. Less than three weeks after his success at the Met, Shrader learned he was one of four singers selected to receive a $5,000 Sara Tucker Study Grant from the Richard Tucker Music Foundation. Shrader made his professional debut last summer as Count Almaviva in Il Barbiere di Siviglia with Opera Theatre of St. Louis, and last January sang Florville in Rossini’s Il Signor Bruschino with New York’s Gotham Chamber Opera. Of his debut at St. Louis, Opera News wrote: “Alek Shrader … sang the role of Almaviva with great skill and sensitivity, plus plenty of comic wit of his own.” In July, he was Ramiro in La Cenerentola with San Francisco Opera’s Merola Opera Program. This fall he joins the Juilliard Opera Center. Shrader attended Renata Scotto’s Academia Nazionale di Santa Cecilia Opera Studio in Rome earlier this year. He began his Oberlin studies with Emeritus Professor of Singing Richard Miller, and last October participated in a master class with Distinguished Professor of Voice Marilyn Horne. James Feddeck conducting the competition’s final concert in the Trivoli Theater. 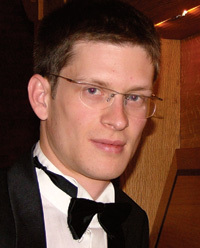 James Feddeck ’05 won the Jordania Grand Prize in the 2006 Vakhtang Jordania International Conducting Com-petition, held August and September 2006 at the University of Tennessee at Chattanooga’s Fine Arts Center. He was the youngest of the 24 conductors from 14 countries vying for the prize and the only American in the top three. Feddeck, who double majored in organ and oboe performance as an Oberlin undergraduate, earned a Master of Music in conducting in 2006. Originally from Scarsdale, New York, he is a member of the Pi Kappa Lambda honor society and studied conducting at Oberlin with Bridget-Michaele Reischl, Music Director of the Oberlin Orchestras, and with Strickland Gardner Professor of Music Timothy Weiss. Feddeck conducted the Jordania Competition Orchestra in Strauss’ Don Juan and Stravinsky’s Firebird Suite at Chattanooga’s Tivoli Theater for the third round of the five-round competition; for the fourth round and the final concert competition, also at the Tivoli, he conducted the Firebird Suite. for an American Symphony Orchestra League Conducting Fellowship; performing, by invitation, Samuel Barber’s Toccata Festiva for organ and orchestra for the 2007 Regional Convention of the American Guild of Organists, held at St. Ignatius Loyola Catholic Church in New York City in July; and returning to the Aspen Music Festival as a conducting fellow this past summer, studying with David Zinman ’58. Feddeck has been appointed assistant conductor of the Memphis Symphony Orchestra for the 2007-08 season. “Oberlin … has broadened my musical horizon,” says cellist Paul Dwyer ’07. The expansive view with which he lives and experiences music caught the attention this year of the U.S. Department of Education, which administrates Jacob K. Javits Fellow-ships. Dwyer was one of only two music students in the country to be awarded a Javits fellowship. The award, more than $40,000 a year for up to four years, will cover his tuition and fees and provide a stipend while he pursues a Doctor of Musical Arts degree in cello performance with Pro-fessor Richard Aaron at the University of Michigan. He won first place in the 2006 Hellam Young Artist Competition. This past year, he won the $2,500 second prize and the Audience Choice Award at the Schadt String Competi-tion for Cello, held in March 2007 in Allentown, Pennsylvania, and the top prize at the Tuesday Musical Associa-tion’s Scholarship Competition in Akron, Ohio. 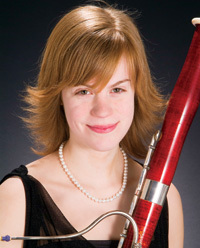 A 2006 recipient of Oberlin’s Ernest Hatch Wilkins Memorial Prize, Dwyer was also one of four winners of the Conservatory’s 2006-07 Concerto Competition [see page 17]. He performed Shostakovich’s Concerto No. 1 for Cello and Orchestra in E-flat, Op. 107, with the Oberlin Orchestra under the baton of Bridget-Michaele Reischl, Music Direc-tor of the Oberlin Orchestras, in a May 2007 concert dedicated to Oberlin’s retiring President Nancy S. Dye. 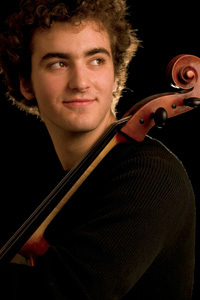 At Oberlin, Dwyer was a student of Assistant Professor of Cello Amir Eldan. He also studied baroque cello with Associate Professor of Viola da Gamba and Cello Catharina Meints and cello with former Professor Peter Rejto and former Visiting Professor Hans-Jørgen Jensen. The experiential nature of the Watson program is what attracted her. “My plan is to get settled into each town, check out the music scene, and let people know that I brought my horn and want to sit in.” says Politz, who is from Holden, Massachusetts. A double-degree student in English and jazz trombone performance (she studied with Associate Professor of Jazz Trombone Robin Eubanks), Politz says that although the Watson Foundation does not impose requirements on what must come of the fellowship, she plans to build on the experience by studying ethnomusicology in graduate school and perhaps writing a book. With pianist Andrew Barnett ’08, she founded the jazz and gospel-tinged Oberlin Gateway Band, whose members include drummer Stefan Amidon ’09 and bassist Nicholas Sternhagen ’09. Politz and the band were profiled in the October 26, 2006, edition of the Worcester Telegraph and Gazette, and were frequently on the music series bill at Cleveland’s Trinity Cathedral. The band released a CD, Lord, Listen to Your Children Praying, last year on the Audica Entertainment label. Since graduating in May 2006 with an Artist Diploma in piano performance, Anastasia Dedik has added three international competition first prizes to a résumé already replete with prestigious awards. 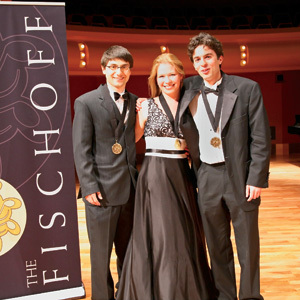 Besides the 2007 Fischoff grand prize and gold medal she claimed as a member of the Prima Trio [see page 11], her most recent victory was in the April 2007 Bradshaw and Buono International Piano Competition. The first prize was a debut performance in Weill Recital Hall at Carnegie Hall, which Dedik gave on May 20. 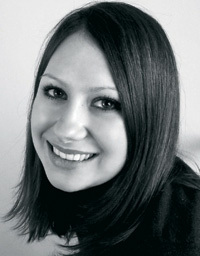 In July 2006, Dedik took first prize in the Association Rovere d’Oro XXI International Competition held in St. Bartholomew by the Sea, Italy, where she was joined by Oberlin junior Anna Vasilieva, who earned fifth place. Both Dedik and Vasilieva are from St. Petersburg, Russia, and both study with Professor of Piano Sedmara Z. Rutstein. Dedik’s first-place prize included a cash award of $1,000 and seven recitals in Europe. A month earlier, in June 2006, Dedik won first prize in the Fifth Biennial Lee Piano Competition held at Augustana College in Sioux Falls, South Dakota. Dedik won $1,000 and a fall 2006 engagement in Augustana’s Artist Recital Series. Scott Meek ’05, a native of Winnipeg, Manitoba, Canada, won second prize—and a cash award of $3,000—in Canada’s most prestigious music competition, the Eckhardt Gramatté National Music Competition. The Eckhardt Gramatté, known by its nickname, the E-gré, is devoted to contemporary music with a focus on Canadian composers. The competition was held in May 2007 at the Brandon Univer-sity School of Music, and portions of the final round were broadcast throughout Canada the same month. In May 2007, Meek earned a Master of Music degree at the Indiana University Jacobs School of Music under the tutelage of Menahem Pressler. He is pursuing a Doctor of Musical Arts degree there, also with Pressler. Meek studied with Associate Professor of Piano Alvin Chow at Oberlin. Pianist Tina Chong ’06 attended the Aspen Music Festival and School for the first time in summer 2006, and she left having won the opportunity to perform with the Aspen Concert Orchestra and conductor Sean Newhouse. Chong studied with Yoheved Kaplinsky during the festival. 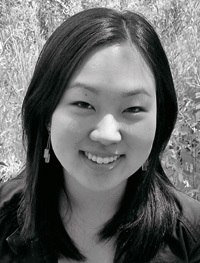 A native of Banff, Alberta, Canada, Chong studied with Associate Professor of Piano Angela Cheng at Oberlin. Tian Lu ’07 took second place in the senior concerto division of the 2007 Kingsville International Isabel Scionti Piano Competitions, and she tied for third place in the senior solo division. The competition was held in March on the campus of Texas A&M University-Kingsville. A native of GuangXi, People’s Republic of China, Lu studied with Professor of Piano Monique Duphil. In April 2007, Elena Lascheva ’08 won second place in the 47th Annual Young Artists Competition, held in Lima, Ohio, and organized by the Friends of the Lima Symphony Orches-tra. Lascheva won a cash prize and a performance as featured soloist with the orchestra. She is a student of Professor of Piano Lydia Frumkin. In January 2007, HanQing Zhou ’10 beat out other talented pianists from some of the nation’s top music schools for the opportunity to make a professional concerto appearance—the top prize in the Firelands Symphony Young Artist Competition (Sandusky, Ohio). Zhou, a 20-year-old first-year student from Chengdu, People’s Republic of China, is a student of Professor of Piano Peter Takács. Two students were invited to participate in international organ competitions held this summer: Songsun Lee AD ’06, MM ’08 competed in the International Organ Interpretation Competition, held in June in Nürnberg, Germany, and Balint Karosi AD ’05, MM ’07 competed in the Interpreta-tion Competition during the Interna-tional Organ Festival at St. Albans (England), held in July. Karosi is a native of Budapest, Hungary. 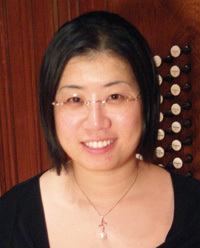 Lee, a native of Seoul, South Korea, was one of 16 finalists invited to the Nürnberg competition, which is part of International Organ Week, one of Germany’s biggest and oldest festivals of sacred and organ music. Just a few months before learning the outcome of her Nürnberg application, Lee took first prize in the San Marino Elizabeth Elftman Organ Competition, held in March in San Marino, California. Her prize included a cash award of $1,000 and a winner’s recital. In spring 2007, American Guild of Organist chapter competitions through-out the country resounded with the winning sounds of Oberlin organists. Sarah Moon ’08, of Toledo, Ohio, took first place in the Ann Arbor chapter competition. Hannah Brewer ’09 of Ojai, California, took first place in the Los Angeles chapter’s competition. Glenn Hunter ’09 of Ottawa, Ontario, Canada, won first prize in the Cleveland, Ohio, chapter. Christopher J. Howerter ’09 of Emmaus, Pennsylvania, captured first prize in the Worcester, Massachusetts, chapter. 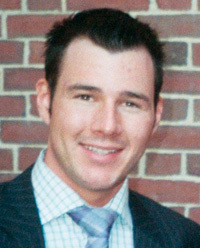 Brandon Santini ’08 hails from Weymouth, Massachusetts, and he won second place in the Boston chapter’s competition. More than 30 violists from the country’s best conservatories converged on the Oberlin campus in March for the Ohio Viola Society’s 2007 Solo Competition. First prize was a three-way split, and two of the recipients were Oberlin students: Meredith Crawford ’09 of Berwick, Maine, and Clio Tilton ’08 of West Lafayette, Indiana. No second prize was awarded. Crawford and Tilton study with Peter Slowik, Director of the Division of Strings and Professor of Viola. Five of Slowik’s pre-collegiate students captured the top prizes in their divisions. Judges for the senior division were Louise Zeitlin of Baldwin-Wallace Conservatory of Music and Katherine Lewis of Illinois State University; in the pre-collegiate divisions, the judges were Jeffrey Irvine of the Cleveland Institute of Music and Lisa Boyko, violinist with the Cleveland Orchestra. 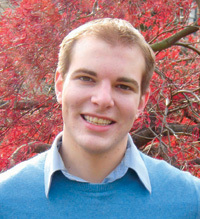 In June 2006, violinist James Garlick ’06 won the 2006 Ladies’ Musical Club of Seattle Awards Tour Competition. Garlick is from Port Angeles, Washington. He received a cash prize of $2,000 and a performing tour of Washington State, which he undertook in September 2006. A double-degree student in neuroscience and violin performance at Oberlin, Garlick studied with Professor of Violin Gregory Fulkerson ’71. Bass Damien Pass ’06, MM ’07 shared the first place award at the Opera Guild of Dayton’s Tri-State College Vocal Competition, held in April at the Dayton Art Institute. Pass, from Canberra, Australia, studied with Associate Professor of Singing Salvatore Champagne ’85. Soprano Jessica Marcrum ’07 of Chicago, who studied with Professor of Singing Daune Mahy, won the first place award and $1,000 at a competition sponsored by the Akron Symphony Orchestra this past year. Another Mahy soprano, Jennifer Forni ’06 of Puyallup, Washington, won first prize in the junior division of the Columbus Interna-tional Opera Competition. Some prestigious summer programs, festivals, and opera companies had Oberlin-trained singers among their ranks recently. Sopranos Ami Vice ’06 and Stephanie Washington ’07, baritone Jason Eck ’08, and bass Damien Pass won auditions to the Music Academy of the West in Santa Barbara, California, this summer. Baritone Justin Manalad ’08 won an audition to attend the Brevard Summer Institute and Festival, where he performed the role of Lancelot in a production of Camelot. Soprano Sophie Wingland ’08 spent part of her summer vacation at the Chautauqua Music Festival after attending the Opera Theatre of St. Louis Apprentice Program for Young Singers, where she was joined by sopranos Jennifer Forni ’06 and Jennifer Jakob ’07, who were returning for their second St. Louis engagements. Baritone Colin Levin ’08 was accepted as a studio artist at the New Jersey Opera Theater. Oberlin’s influence on the opera world is keenly felt at all times, but recently it received international recognition in Opera News magazine and by the National Opera Association. Three Oberlin alumni are on Opera News’ list of “the 25 Most Powerful People in Opera”: Stephen Lord ’71, Music Director of Opera Theatre of St. Louis and Boston Lyric Opera; Julie Taymor ’74, whose dazzling productions have awed audiences and critics alike; and Alec Treuhaft ’75, Senior Vice President and Director of the vocal division of IMG Artists North/South America. The list and related article were published in the August 2006 issue of the magazine. Two more graduates were recognized for their contributions to opera when the National Opera Association held its Legacy Awards banquet in January 2007: Pulitzer Prize-winning com-poser George Walker ’41 and operatic baritone and teacher William Ray ’52. Walker and Ray received the association’s “Lift Every Voice” Legacy Award, which recognizes the contributions of African American artists to opera in the United States. Joycelyn Eby ’09, a bassoon performance major from Seattle, received third place and a cash prize of $2,500 in the Meg Quigley Vivaldi Competition, one of the most prestigious competitions for bassoon players. The finals were held June 11, 2007, at the Interna-tional Double Reed Society’s conference on the campus of Ithaca College in Ithaca, New York. Eby was one of five finalists in the competition. Alumnae Nicolasa Kuster ’93 and Kristen Wolfe Jensen ’89 codirect the competition, which they founded in 2004. Eby, who studies with Professor of Bassoon George Sakakeeny, is also an East Asian studies major in the College and has performed as a principal player with the Oberlin Orchestra, the Oberlin Chamber Orchestra, and the Oberlin Wind Ensemble. She is a founding member of the Oberlin Bassoon Quartet, whose YouTube turn with the Super Mario Bassoon Quartet (www.youtube.com/watch?v=2gXh83hNnWw) has made Eby and the other quartet members—Guangyuan Shi ’07, Nathan Landes ’08, and Yunle Feng ’09—famous worldwide. When this issue of Oberlin Conservatory went to press, their performance of Super Mario 3, Super Mario World, and other video-game tunes had been viewed more than 73,000 times. Clarinetist Boris Allakhverdyan ’08, a member of the Fischoff-winning Prima Trio [see page 11], was also a solo award recipient this year, winning first prize and $5,000 at the Hellam Concerto Competition, held in March 2007 in Springfield, Missouri. Another Oberlin-trained musician took a top prize at the Hellam Com-petition this year: cellist Shama Cash-Goldwasser ’06 performed Ernest Bloch’s Schelomo to win third prize. A double-degree graduate of Oberlin with diplomas in cello performance and biology, she’s doubling again; she is enrolled as a master’s degree student in the Uni-versity of Michigan’s School of Music and in its School of Public Health. At Oberlin, Cash-Goldwasser studied with Assistant Professor of Cello Darrett Adkins ’91. Javits fellow Paul Dwyer ’07 [see page 12] was not the only Oberlin winner at Akron’s Tuesday Musical Club Scholar-ship Competition, held in March at the University of Akron. Violin performance major Allison Lint ’10, of Cuyahoga Falls, Ohio, won at the local level in the string division, and flute performance major Brandon George ’08, of Columbus, Ohio, won the statewide prize in the woodwinds division. Ryan Welsh Jr. ’08, a composition major from Chicago and a student of Professor of Composition Lewis Nielson, received the 2007 Presser Award for demonstrating excellence and outstanding promise for a distinguished career in the field of music. Members of the Conservatory faculty nominate Conservatory students for the Presser Award, and the recipient is chosen by the Honors and Awards Committee. Percussionist Stefan Amidon ’08, a jazz studies major from Brattleboro, Vermont, and a student of Assistant Professor of Jazz Percussion Billy Hart, made his national radio debut in April on American Public Media’s A Prairie Home Companion, hosted by the incomparable Garrison Keillor. The program, broadcast on National Public Radio stations across the country, presented its first annual “People in Their Twenties Talent Show.” Stefan is a drummer with the honky-tonk Brooklyn-based band Sweetback Sisters, one of six musical acts vying for the top prize. Listeners voted online for their favorite act during the broadcast; Amidon’s band won second place, only 16 votes shy of the first place award. Amidon, his bandmates, and the other contestants also participated in the program’s beloved Guy Noir, Private Eye segment. Colin Levin ’07, a double major in the Conservatory studying voice with Professor of Singing Marlene Ralis Rosen and music history with Asso-ciate Professor of Musicology Charles McGuire ’92, was invited to participate in WNYC Public Radio’s special series, The Tristan Mysteries, which aired April 28 through May 4, 2007. Levin’s fondness for Wagner, his collection of 17 recordings of Tristan and Isolde, and his experience giving lectures on the composer and the opera’s overture and liebestod made him “completely perfect” for the project, says senior producer Amy O’Leary. Levin’s segment, “The Sexual Mystery,” was broadcast May 3. The series is archived on the WNYC’s web site: www.wnyc.org/music/tristan.html. 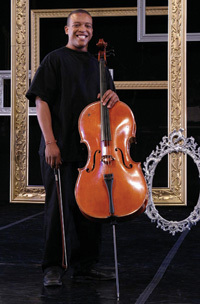 Ismail Akbar ’08, a student of Associate Professor of Viola da Gamba and Cello Catharina Meints, was the featured cello soloist in the second act of Andrew Lloyd Webber’s Song and Dance, staged at Greater Cleveland’s Beck Center in March and April. Called “a concert for theater,” the musical has two distinctly different acts. A one-woman tour-de-force first act is followed by a ballet choreographed to Variations, a piece Lloyd Webber composed for his cellist brother, Julian, and which was performed at the Beck Center by Akbar and the Cleveland dance troupe Verb Ballets. “Ismail was fantastic to work with,” says Larry Goodpaster, Song and Dance’s musical director. “He was truly magnetic in his performance.” Donald Rosenberg, classical music critic for the Plain Dealer, wrote in his review of the production: “ … Akbar does dashing work as the Paganinian protagonist.” Akbar is from Atlanta, Georgia. Four Conservatory seniors were selected from 19 finalists to win Oberlin’s 2006 Concerto Competition, which was held in October in Finney Chapel. Each student received the honor of performing as soloist with the Oberlin Orchestra and Oberlin Chamber Orchestra during the 2006-07 season. The first concert to feature an Oberlin laureate occurred in November 2006. Pianist Ji Yeon Shin ’07 of South Korea, a student of Associate Professor of Piano Haewon Song, performed Rachmaninoff’s Rhapsody on a Theme of Paganini, Op. 43 with the Oberlin Orchestra. Clarinetist Jack Marquardt ’07 performed Aaron Copland’s Clarinet Concerto with the Oberlin Chamber Orchestra in December 2006. A student of Asso-ciate Professor of Clarinet Richard Hawkins, Marquardt is from Lake Forest, Illinois. In March 2007, soprano Jennifer Kelsey Jakob ’07 of Kempten, Germany, sang Benjamin Britten’s Les illuminations with the Oberlin Chamber Orchestra. She studied with Professor of Singing Marlene Ralis Rosen. 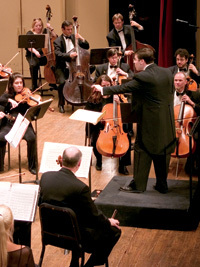 Oberlin’s orchestral season concluded in May 2007 with cellist Paul Dwyer’s performance [see page 12].